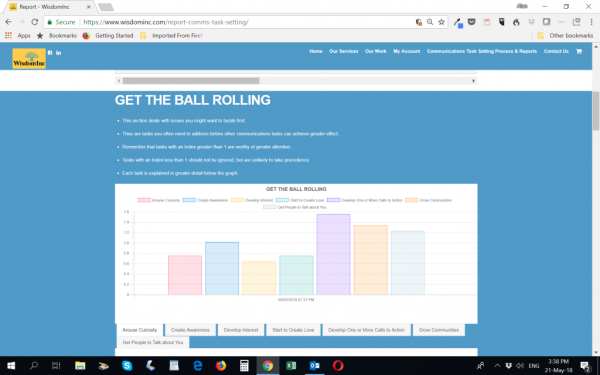 Takes you through an online questionnaire based on YES / NO questions designed to be comprehensive while speeding up the process. It links your business needs and situation to priority communications tasks and a road map you can then implement. 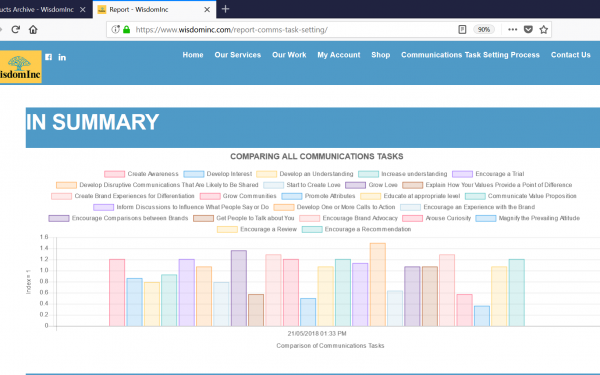 Provides you with four reports to highlight your priority communications tasks based on your specific needs. 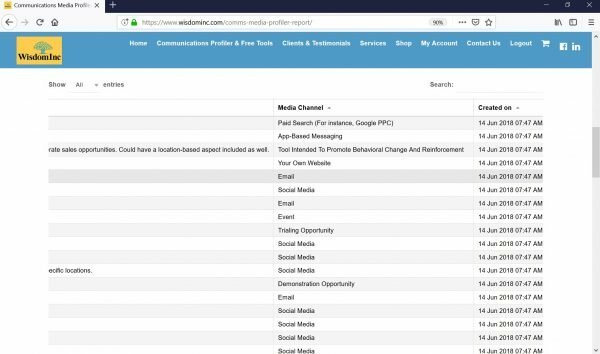 An additional report that will then highlight the key media channel types that are likely to work best for you based on these priority communications tasks. 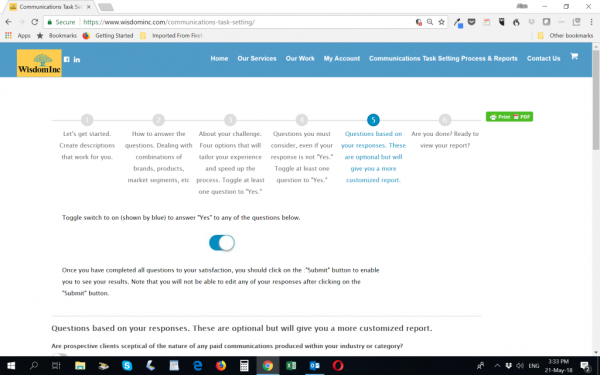 Communications tasks are explained to you in a quick guide. Insights are derived from over two decades of strategic expertise through our database of over 1,200 data points. This means that reports are comprehensive in their thinking. Handle sensitive issues, such as different opinions on communications tasks, with greater ease. This comes through using this as an impartial tool to weigh in on the key communications tasks you require. Consistent thinking across your team. Useful if your employees have varying skill sets or are new to your business and you wish to apply a quality control process to how they identify priority communications tasks and follow through on these. Apply this process on each of your services, products, brands or target market segments. Works for B2C or B2B. Useful for Product or Services marketing. It consists of the Communications Task Profiler that takes you through an online series of questions designed to better understand your communications challenges. This is customized to address your specific requirements and save you time. The Communications Media Channel Profiler converts these priority communications tasks into a road map you can implement. 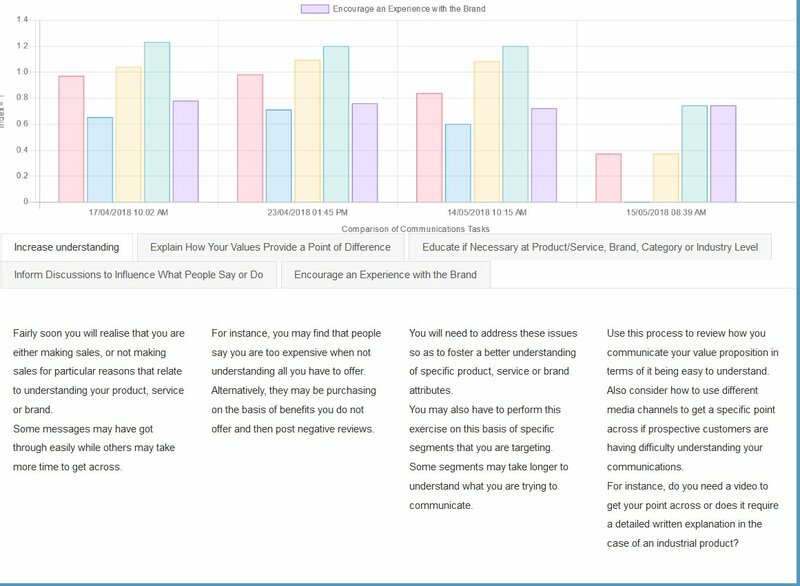 Priority communications from the Communications Task Profiler are run through an algorithm created to highlight the better media channel options for your specific requirements. 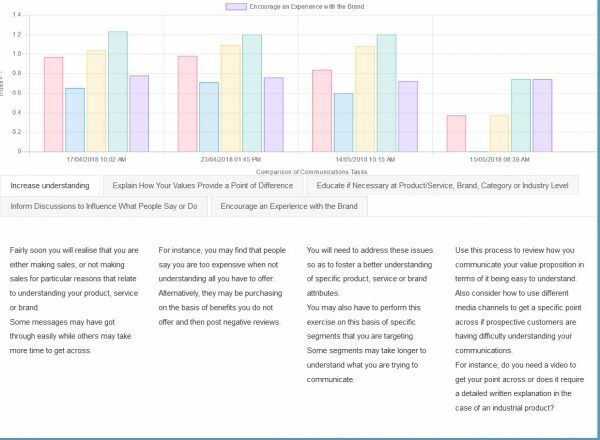 The best media channel choices are then presented to you with a score (higher is better). It is ideal for entrepreneurs that may not have a communications agency but want to better understand which communications tasks to focus on. It can also be used by larger organizations with ease. Get an immediate report detailing what you should focus on. Check whether you are investing in the priority communications tasks as your business grows and targets new market segments. 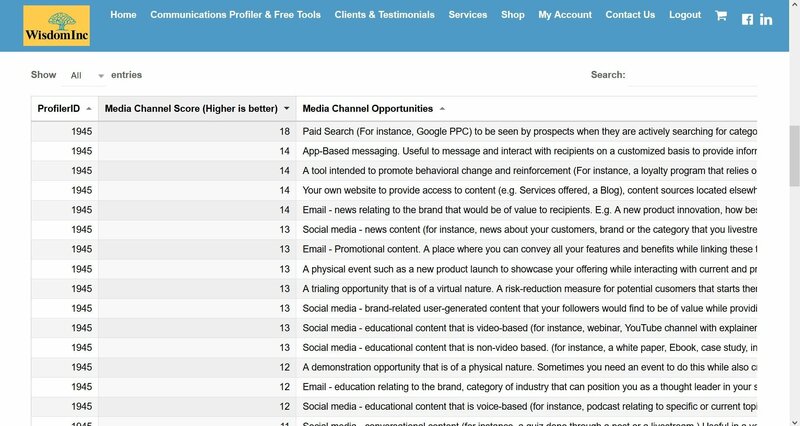 Our experience is that many marketers do not have the resources to execute all media channel opportunities simultaneously. 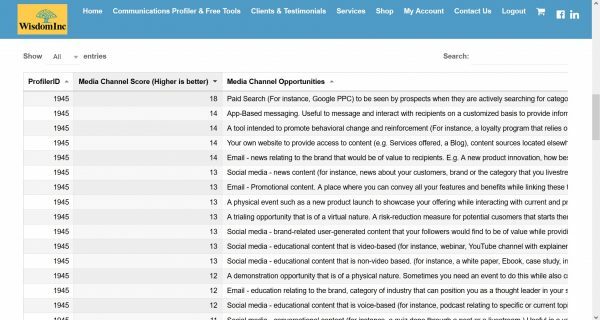 The Communications Media Channel Profiler highlights more promising opportunities.